Writing about India brings back so many memories. 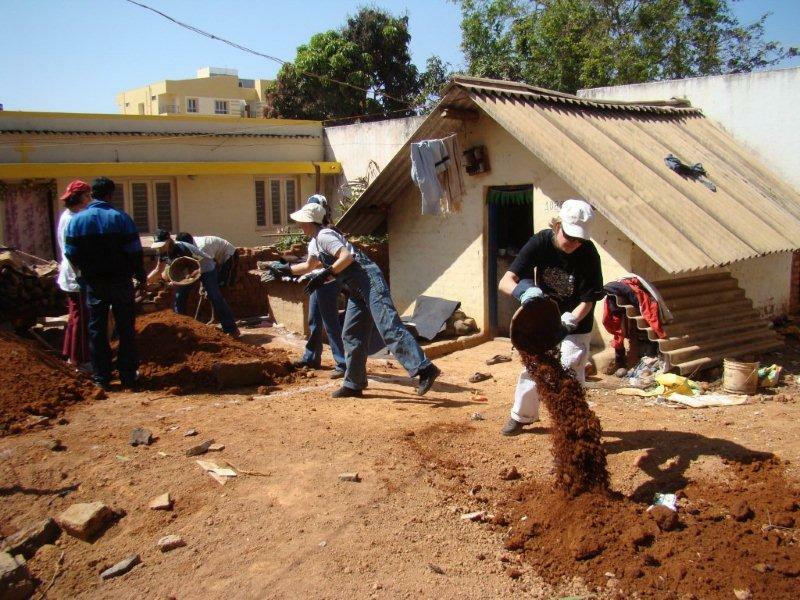 Last week I was writing about the first time that I volunteered with Habitat for Humanity, India. 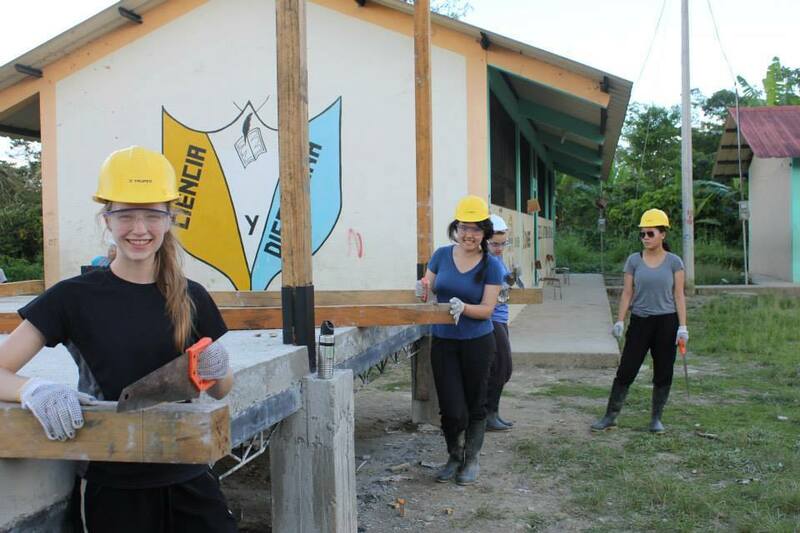 Fitting, since my daughter was in Ecuador last week, volunteering with Me to We, a Canadian charitable organization. 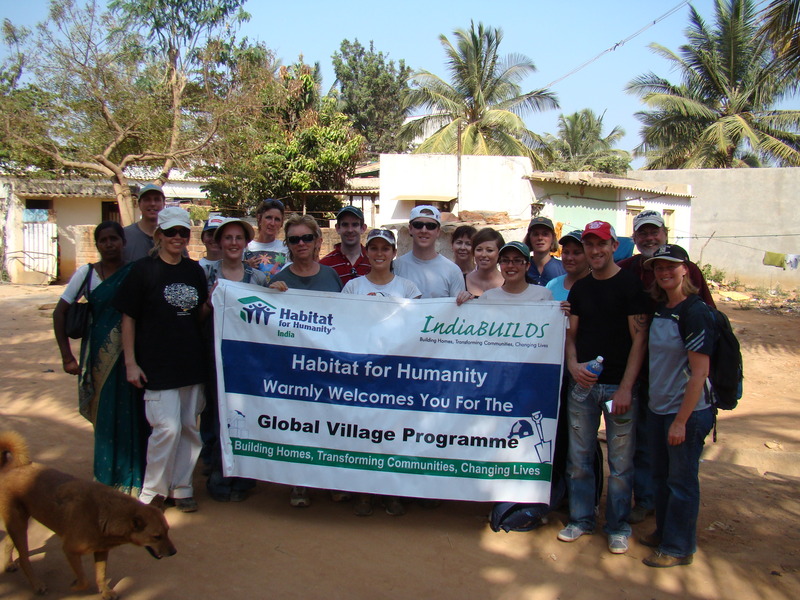 For me, building houses with Habitat was one of the highlights of my time in India. I remember being so naive, thinking that we were actually going to build a house – all in one day. It was a real eye opener to learn that Habitat was helping not just one family, but an entire village, and that it would take weeks or months to build a home, depending on the availability of volunteers and funds. The house that I worked on was just in the beginning stages and we spent the day digging and carrying away dirt. We worked alongside the husband and his brother. Sweat equity they called it. What I liked about Habitat for Humanity was that they gave a “hand up” not a “hand out.” Families paid back a no-profit loan and they helped build the house with their own hands. I remember how hot it was that day and how hard-packed the red soil was, with big stones embedded in it. All we had were these rudimentary tools – picks for digging, and shallow round bowls for carrying the dirt away. Every once in a while, one of us westerners would wish out loud for a proper shovel, a wheel barrel or some sort of machinery to hasten the pace. It was painful, knowing how fast the work would have been done back home, with first world machinery. When I finished volunteering that first day, it was hard to leave, to wave goodbye to the children who had gathered to watch us work. To say goodbye to the husband and the brother who worked with us all day, and the grandparents who watched from the shade of a papaya tree. I put my hands together and bowed my head in respect, to thank them for letting me come and help out. “Namaste,” I said. When I looked up, I saw such gratitude in their eyes, and all I could think was no, it’s me who is the lucky one. She was telling me all about her trip to the Amazon: the people that she met; running out of shower water; the work that she did on a school – mixing cement, painting, sawing and carrying wood. She told me how they calculated that a family of three would have just 43 cents to buy food for a meal. That would buy a bit of rice, a potato, an onion and a tomato. “That was a real eye opener,” she told me. We have landed on Canadian soil – with no return ticket in hand. We’ve been off of Planet India for two weeks, decompressing in Greece. Two weeks? It already seems like a lifetime ago that we were in India, in fact it seems unreal that we actually lived there. Maybe Greece – Santorini in particular – was too good to us? The food, the wine, the vistas (spectacular), the relaxed/no worried atmosphere – just too tempting to stay longer. Guiltily we all admitted we didn’t miss India at all. There is a term, after a long relationship ends and you meet someone else right away – the new guy is known as the rebound guy. The rebound guy is so great he helps you get over your long relationship guy. Well, Greece was our rebound guy, so good that we had no desire to go back to India, it made our inevitable return to Canada much easier. Just before landing in Vancouver the pilot told us the temperature was 16 degrees celcius with blustering winds. It seemed like we descended through ten minutes of clouds and I was waiting for what lay underneath. Rain. Dark. Cold. But we saw a glimmer of sunshine that somehow made it through the clouds…it was bright and chilly, but not windy – this would do. We were greeted at the airport by family and whisked home to Michael’s sisters’ house. Our tennants moved out of our house on the 29th and we got the keys back to our house. It will be about a week before we move in but it is nice to have a home to go back to. Our home. Canada. I am sure we will miss our “rebound guy,” Greece, but I know in the end it will be India that will creep back into our thoughts and our memories. There is no place like India. I hesitate to sign off completely, to finsh blogging. There is a lot more to write about, believe me. So many stories that I could not tell while in the country – many funny stories, some frustrating ones, but all unbelievable. 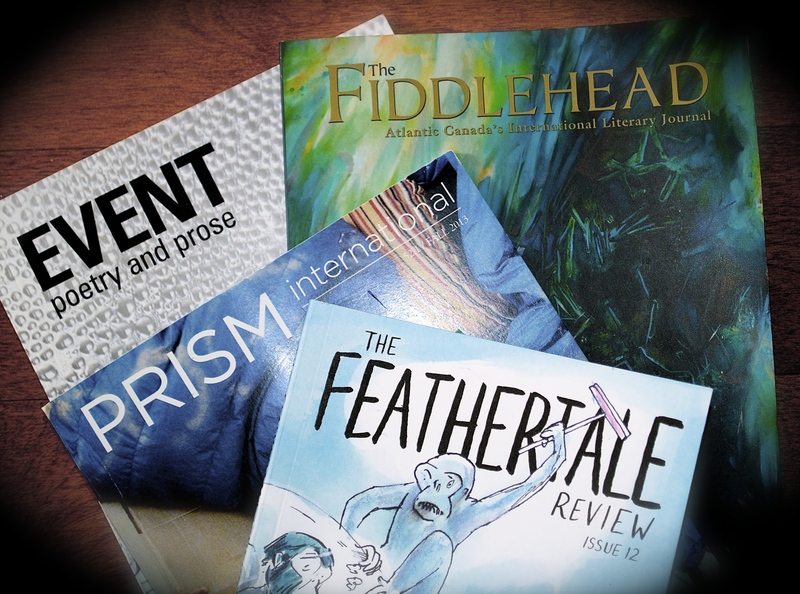 Eventually I will put it all down in writing, maybe a little at a time, maybe all at once. Married a prince but still not a princess? Doesn’t seem right does it? After all this time – ten years – and all the thought that went into “do I really want to be a princess,” and what does she get – HRH the Duchess of Cambridge. Kate’s certainly giving up any sense of an ordinary life – one would think she would at least be given the title of Princess. But no, the Queen had a bunch of titles thrown into a hat and pulled out HRH the Duchess of Cambridge – at least she gets to use HRH. 1)Elton John – caught on camera singing hymns looking rather stuffy – come on Elton snap your fingers or move your hips a little. She didn’t get a front seat at the wedding. She was royally pregnant and mad at her Dr. for refusing to do a c-section prior to the wedding. The cameras panned to Kates’ Mom singing “God Save the Queen” with the gueen sitting practically next to her. That must have been an “aha” moment. After the “kiss on the balcony” the couple drove off in an Astin Martin; probably a wish of the prince – “just once I’d like to drive a car down that road with the top down.” Well don’t get used to it cause it’s never going to happen again “future king.” Did you notice the big “L” on the front of the car? A little embarrasing but yes, even a prince has to get a learners license. Whereas Charles and Diana had the fairytale wedding this so reminded me of “The Sound of Music” weddding. The music, the boys choir and the high camera shots from above – definitely reminded me of Julie Andrews walking down the isle. Now that I think of it maybe even the dress? I’ll have to get out the CD and compare the two. I have to interupt my Kabini posts for a quick view on the Royal Wedding. First of all please excuse any grammar/spelling mistakes because 1)I’m writing this blind and 2) I’ve had a few glasses of Proseco – couldn’t afford Kate and Wil’s $1500 bottles of wine. Started watching coverage early with a lot of blah blah blah about Diana and this and that. Also had to go to my children’s science fair at 1:30 – what kind of a school schedules a science fair during the Royal Wedding coverage? Anyway stayed for a reasonable length of time and made it back to see the royals arriving at Westmenster Abbey. Flipping back and forth from CNN and BBC but the choice was made when the royals were leaving Buckingham Palace in minibuses – the BBC named the royals in a monotone voice – while CNN roared with laughter at the silliness of royals in minbuses, wondering if they were having a few drinks and singing songs! Promptly decided CNN was the way to go – Kat Deely of “So You Think You Can Dance” fame, Piers Brosnon, and Anderson Cooper. What did I think of the wedding – understated – it was like a couple of good friends getting married, very mature and well thought out – in love. Hard not to compare it to Charles and Diana who barely new each other – theirs really was more of a fairy tale. While the wedding today was well thought out between two people who really knew each other. The dress? Lovely, a little old fashioned with the lace, high collar and long sleeves. Worst dressed – the Duke and Duchess of Yorks’ daughters – Eugenie and ? Miss Piggy blue dress and Mickey Mouse hat – sad. Lovely day for the Middleton’s – they must have been gobsmacked – their daughter marrying a royal. It was all very lovely but not the pomp and circumstance because the couple is much more down to earth than most other royal weddings. Let’s hope they are partying into the night with friends and enjoying the moment. Wickets, overs, bowlers, strikers, outs. Sachin, Dhoni, Gambhir, Singh. Hey, a month ago none of this meant anything to me but living in India how can one not get swept up in cricket-mania! And at 8 hrs a game it’s not hard to figure it all out after a couple games – well, not everything but I can pretty much figure it out. India should be proud, and they are I tell you. Last nights game started well for Sri Lanka who ended up with 274 runs after batting first. India got two outs within the first 30 balls and Indian fans looked a little depressed. But they came back slowly and surely and in the end when they only needed one run to win – they got a sixer – a beautiful ball hit into the crowd to win it all. Congrats India – glad to be here to watch it and great to be on the winning side! I only thought a handful of people were reading my blog. If I look at my profile page I see the number of profile views which I thought was the same as blog views. It’s at about 2300, over 19 months. That’s why I thought not many people read my blog – just a few loyal family members and friends. And who is looking at the blog? Well, I can’t tell exactly but by country India is way ahead, then U.S., Canada, U.K., Germany, Thailand, Malaysia, Australia, Netherlands, Finland, Ireland. It is cold. I decided today I’m not going outside anymore. We went for a walk in sunny White Rock last week and today we walked around Beaver Lake near my parents house in Victoria. Both days I froze. I don’t quite have the best cold weather gear and had to cut the walk short today. We whipped home and warmed up with Mom’s hot chocolate with marshmallows. But, I’m not going out anymore. Last years Christmas in Bangalore will be one that we remember: our Dr. Seus Christmas tree, lying by the pool, steak dinner and Christmas Eve mass where more people wore saris than not. This year we didn’t have our own tree or home for that matter. But we were home in every other sense of the word. We decorated a Christmas tree at Michael’s Dads, we ate Christmas oranges and made gingerbread cookies. We drank rum and eggnog. We had the traditional Ukrainian feast at Lynn’s. We went to the Ukranian church for Christmas Eve mass together as a family where at an opportune moment a little kid yelled out, “All you do here is yak, yak, yak.” Everyone laughed and then the choir promptly started singing Silent Night. On Christmas morning we got up, opened presents and had a nice breakfast at Michael’s Dads. Then it was off to the ferry and to Victoria to visit my parents. We had the traditional turkey dinner with mashed potatos, gravy, stuffing and vegetables. We had desserts galore – pies, nanaimo bars, shortbread, Christmas cake – the works! Today, the day after Christmas we relaxed – we played games, ate turkey sandwiches and had leftover turkey for dinner. We watched hockey on TV. Watched the opening ceremonies of the Commonwealth Games last night. They went off beautifully, India can be proud of the show they put on for the world – dancing, drumming, culture, color and history (and there’s a lot of that to show off). Jai Ho! Last week the Ayodhya decision was made. The three judges ruled that the Ayodhya land will be split three ways: one part going to the Muslims and the other two to Hindu groups. Although the case may be appealed and end up in the Supreme Court, there was peace in India after the verdict.